This recipe produced a simple, surprisingly bland rice...even with all its veggies and spices included. 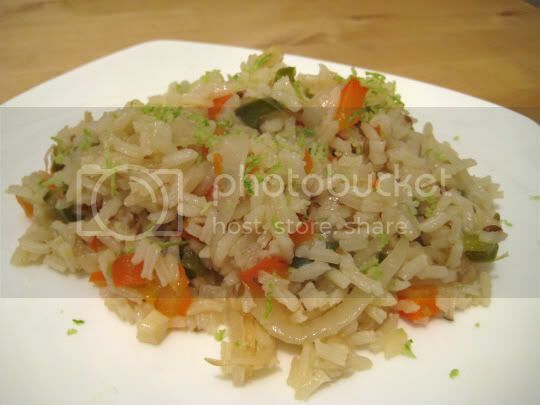 Sliced onion and garlic are sauteed with red and green bell peppers, giving a nice base to the rice. But at the end of cooking, all you can taste is bell-pepper-flavored white rice, plus the spice of cumin seeds. I also expected this to be more Latin flavored, but the cumin seeds give it an almost Indian vibe. If I was going to continue eating the rice, I needed to add something to it, since even the lime zest sprinkled on top didn't add much flavor. Going for the Latin theme on the next try, I added a couple packets of Taco Bell Mild Sauce. Better. The next bowl, I added a container of Jack in the Box Teriyaki Sauce...and finally, some flavor! Almost a sweet-and-sour stir-fry kind of dish. Make again? Probably not. At least the additions made this edible though.